I met Jason on a small skiff off the coast of the island of Grenada in the Caribbean just after he had completed a one of a kind project called viccisitudes in 2006. Viccisitudes is a set of sculptures designed to live underwater. 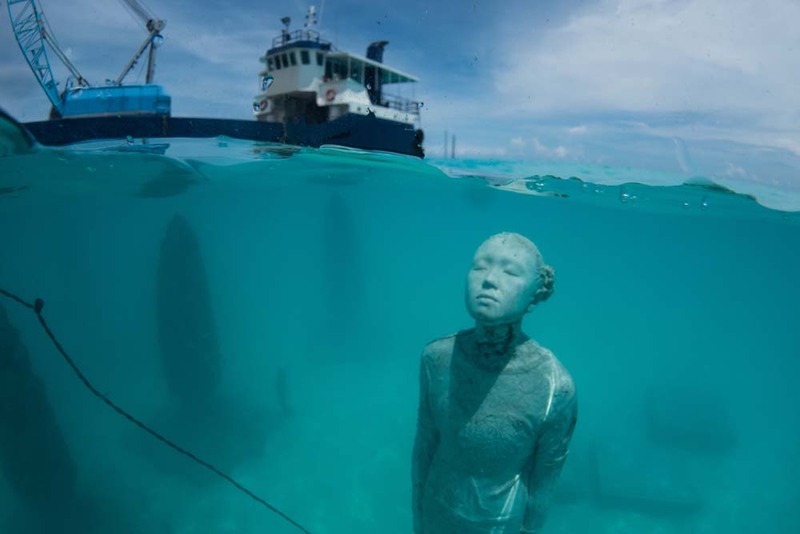 The depth of the installation (5m) as he calls them is such that you can enjoy the art from snorkelling and you don't need to visit using scuba gear. This has remained a feature and beyond that many of the more recent works are visible from outside the water too. Coralarium features the ability to take a tour around the pieces. The installation is in direct alignment with a swimming pool at the luxury resort of the Fairmont Sirru Fen Fushi. Located on the maldive shores of the luxury hotel the Fairmont Sirru Fen Fushi is a 'reverse zoo' not normally how we view the animals says Jason. Watch the video to learn about the construction and idea beyond the 'piece' and the symbolism in a part of the world due to feel global warming effects first. The Rising Tide installation located at Vauxhall in the river Thames. Horses with heads formed with imagery from fossil fuel harvesting and a generational notion that the 2 older riders are ignoring the future while 2 riders are young who will inherit and have to live with it. The sculpture works with the tide twice a day drawing you in to watch it whenever you pass to see where it it's at. The first and original installation in Grenada at Moilinere Bay. Jason De Caires Taylor is at it again !